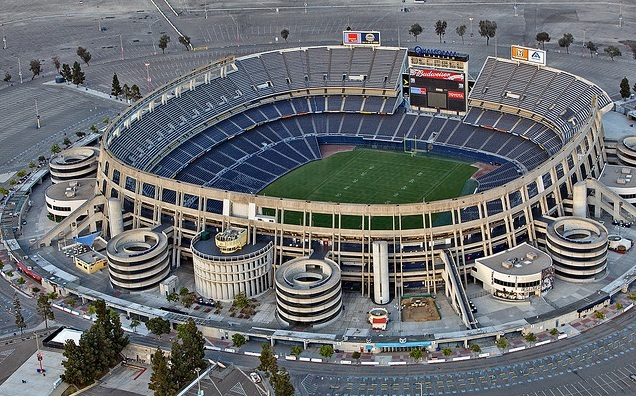 Stadium Issues Fuel Relocation Talks for San Diego Chargers – #SportsTechie blog. The SD Chargers franchise appears poised to request a transfer to Los Angeles after this season. The main reason for this is the need for a new stadium – and the unwillingness of San Diego taxpayers to foot part of the bill. The Sports Techie community blog does a deep dive look at what this means to loyal San Diego Chargers fans, the city of Los Angeles and the use of cities as stadium pawns by the NFL. 49ers Levi’s Stadium will seat 68,500 inside 1,850,000 square feet showcasing a 13,000 square foot HD video scoreboard big screen jumbotron and two additional fascia display scoreboards. Why Is a New Stadium Necessary? The original Chargers stadium was built in 1967, and it has not been upgraded since 1997, according to ESPN. The facility is obsolete in terms of its technology, security and also has maintenance issues: cracks in walls and floors, leaking pipes and other signs of age. Qualcomm Stadium also lacks sufficient premium seating, and the press box desperately needs renovation and a technological boost. These are just a few of the issues that are preventing San Diego from winning a bid to host the Super Bowl. A larger, state-of-the art facility could bring in a significant amount of additional revenue both for the team and the city, and would make the franchise more attractive to top-notch talent. 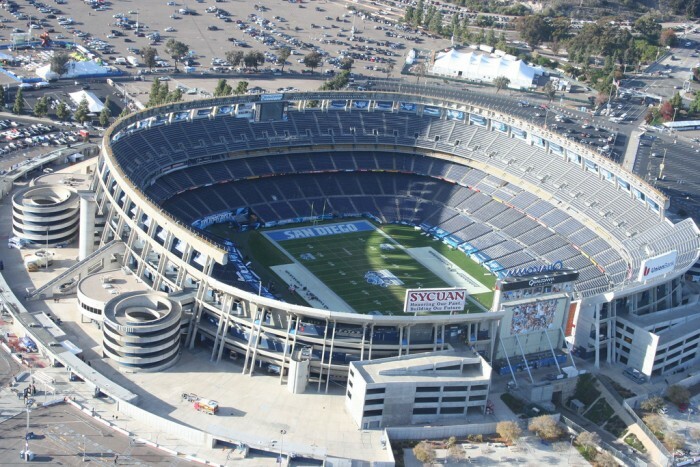 Stadium Issues Fuel Relocation Talks for San Diego Chargers – Sports Techie blog. 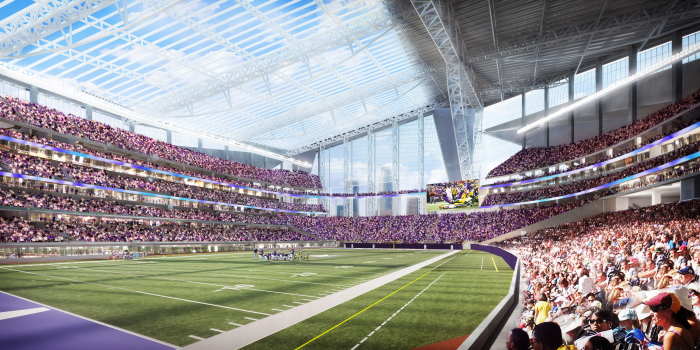 The new Minnesota Vikings stadium, described in the article “ New Minnesota Vikings Stadium Installing LED Lights by Ephesus Lighting,” is a fine example of how a modern sports arena can lead the way with eco, broadcast and fan-friendly LED lights that increase athlete performance. If San Diego taxpayers refuse to fund upgrades to Qualcomm Stadium, then the Chargers’ relocation to Los Angeles appears inevitable. The Chargers have been petitioning for a new stadium for the last decade. The most recent proposal from the franchise involved a state-of-the-art facility with a rollback ceiling that would have been attached to a new conference center and located downtown. In response, officials from the city of San Diego presented a proposal for a stadium located in Mission Valley. They provided blueprints, a financing plan and an Environmental Impact Report. The franchise immediately said that it was unwilling to accept the proposal because the EIR would not hold up to potential legal challenges. The Chargers have been discussing a possible move to Carson, a suburb of Los Angeles, along with the Oakland Raiders. The city of Carson recently approved plans for a new combined Chargers-Raiders stadium if the NFL decides to allow the two teams to move. The city and county of San Diego, meanwhile, opposes the move and is trying to show the NFL that they have the ability to construct a new stadium. The problem comes down to financing. The Chargers’ proposal relies in part on funding from both the city and the county, and a special vote would be required to pass the necessary tax measures. At this point, the NFL is likely to make a decision regarding the proposed move to Carson as early as January 2016, before such a vote could be held. The future home of the San Diego Chargers has yet to be determined, and football fans and San Diego taxpayers wait in anticipation as their city, county and the NFL finalize negotiations. Paul Allen and THE Sports Techie after the Our Team Works Stadium Campaign win. 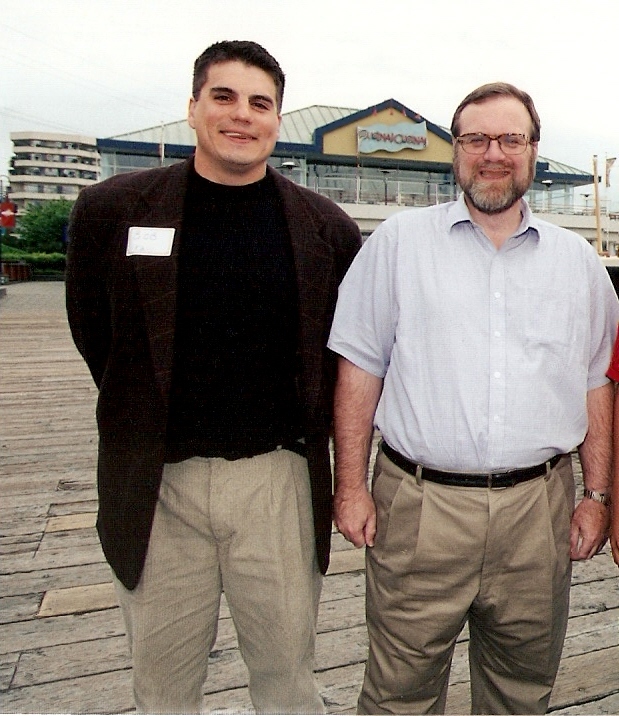 Sports Techie, since working for the Our Team Works stadium campaign team in 1997 for Seattle Seahawks owner Paul Allen, I have switched my view on the use of public funding for new stadiums 180 degrees the other way. The Seahawks won Referendum 48 by a slim 1.5 percent margin so it certainly was not a unanimous decision by Washington state voters and 12s to give a billionaire tax payers money to help fund the construction of beautiful and competitive edge, Century Link Field. Mr. Allen was nice enough to purchase the team from Ken Behring but for the record, if the public funding vote would not have passed he was also ready if necessary to move the team to California. Leveraging cities against each other and taking a team away from a city if they don’t allocate public funds is how professional sports leagues and owners historically operate. Take the Seattle Sonics, a NBA team I loved as a kid and winners of the 1979 NBA Championship. Owner and Starbucks founder, Howard Schultz, sold the beloved team to Clay Bennett and because $220 million in public funding was denied by the city council in 2008, the franchise was fleeced to Oklahoma City with the heavy support of then commissioner, David Stern, thanks to a sweetheart arena deal and Stern’s desire to continue extorting public money for arena deals because that was his job. Seattle was used in 2014 as a venue pawn for the Sacramento Kings in order for their new arena deal to close. The Wisconsin State Assembly recently caved in and granted $250 million (it might actually be near $500 million considered arena land was sold by Milwaukee for $1) in tax payers money to keep the Bucks or risk losing them to a city like Seattle. The NHL asked Seattle to get involved with their recent expansion bid which surprisingly was never a serious opportunity but Las Vegas and Quebec City jumped at the chance to fork over Nevadan and Canadian public funds respectively. The Tokyo Olympic Stadium for the 2020 Olympics stands to cost $2.1 billion and Japanese are criticizing the spiraling amount, retractable roof and seating rearrangements for a place Tokyo president 2020 Yoshiro Mori said, “It will be a holy place of sports and culture in Japan.” It that the international way of spinning off a white elephant or does he really believe that the venue will become a holy place like Mecca, Jerusalem. I believe using cities as stadium pawns is truly a broken business model. That model was not needed here in Atlanta though for the new Mercedes-Benz Stadium that will end up costing over $1.5 billion of which $600 million, up from the original $200 million, of public money will be spent instead of allocating for education, transportation and medical programs for state citizens. The fine people of Atlanta and Georgia were not even offered a chance to vote via a referendum whether they actually wanted to give billionaire, Arthur Blank, founder of Home Depot, free money. Since Blank’s purchase of the organization, the Falcons have tripled in worth and now are valued at $1.67 billion according to Forbes. The next ten SEC Championships will be played at the Georgia Dome and at this state-of-the-art facility that will help draw valuable tourism dollars to the state, region, county and city coffers making it a supposedly windfall for folks in Macon, Savanah and Helen, as well as Atlanta, right. Hotel taxes are the primary source of these public funds but remember, money used for a stadium never makes it to state program that could use the influx of tax dollars. The same kind of politics happened with SunTrust Park, the Atlanta Braves new MLB ballpark is expected to cost $622 million of which $392 million is donated by the public. A San Diego State professor crunched the numbers in terms of Chargers value and is convinced the Spanos family will relocate to Los Angeles and earn a sizeable profit. “The minute they move to L.A. the value of franchise goes up by 50 percent,” said Jim Lackritz, Ph.D. The L.A. Dodgers and LA Clippers both sold for $2 billion so does that make a new and exciting NFL franchise in Southern California playing in the leagues most modern stadium with all kinds of sports tech, along with ten million television and digital device viewers, increase the team’s worth to say at least $3 billion when the Chargers are already worth $1.5 billion. Three billion might be a bargain by 2017 when considering the Cowboys are now worth $4 billion making them the most valuable sports franchise in the world. Two more years might see the Cowboys worth soar to $5 billion or more. A Southern California based team has the allure of sun, beaches and celebrity power, future Super Bowls and other entertainment events, to make the move “a no-brainer,” according to Lackritz. The San Diego city council certainly will have to substantially increase public money funding for a new stadium in order for the Chargers to stay in town. The Chargers, Oakland Raiders and St. Louis Rams are in a trifecta campaign for new stadiums and the city of Los Angeles is once again the pawn city. There are two new LA Stadium proposals at a cost of about $1.8 billion each but most of the funding comes from private investors. Is this a new stadium model? Not really, the San Francisco 49ers constructed Levi’s Stadium under a private/public joint venture and the rest is history. The green, sustainable-centric venue will host Super Bowl 50 bringing billions in revenue to the Bay area. 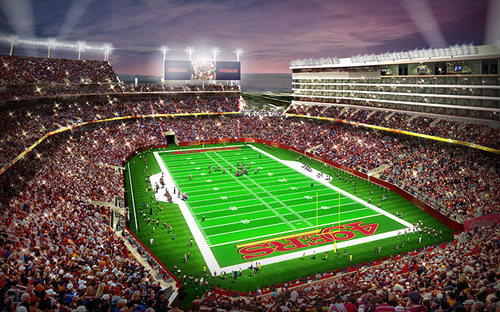 Niners fans that can actually afford tickets are ecstatic with the Candlestick Park upgrade. The multi-billion dollar league also has a poster-venue in Levi’s Stadium other teams and leagues can consider as a new private investment funding model rather than sticking to status quo and demanding more and more public money. LA is the next privately funded stadium model the NFL wants on paper but what happens if all three cities cave in give the owners of the Chargers, Raiders and Rams exactly what they are asking for or very near to it. The answer is LA gets aced out once again yet retains value as a NFL stadium pawn against the next resistant city. If it was up to me, funneling corporate welfare to assist with building new sport stadiums would be yesterday’s news. The simply truth is there is enough private money for the for-profit NFL (changed from non-profit status last year) to stop using stadiums, arenas and coliseums as leverage to squeeze city councils out of tax-payers money for a sport that has equally as big issues to deal with such as concussions, TBI and CTE, domestic violence and a near lame-duck commissioner in Roger Goodell. I feel it is the NFL’s civic and financial responsibility as a monopoly to guide youth and adult football players and their loyal fans such as me, towards a better today and tomorrow for all, by ending the era of public stadium funding. So please let the stadium pawn game end with the Chargers, Raiders and Rams staying put and making things work without the Ray Donovan (HBO show) treatment by NFL Hollywood.